Hello! My name is Louise Mewett and I write the clean eating blog Goodness Me. I have recently graduated from the University of Warwick, where I quickly became bored of the unhealthy student menu (usually consisting of tomato pasta and chicken kievs!). This led me to discover clean eating, it’s fantastic that blogs such as The Kitchen Shed are starting to appear in the UK, and I was honoured to be asked to write a guest blog post! I started my blog about 3 months ago, simply to record my own recipes and to provide myself with inspiration. I hope along the way that it might inspire others too, I am now determined to prove that clean eating can be easy and cheap but most importantly delicious! It’s about experimenting with food, so that you can continue to enjoy your favourite meals, whilst packing in the most amount of goodness. I usually have a smoothie for breakfast, they make it that little bit easier to get out of bed in the morning! I have a fantastic smoothie bottle, which means that if I’m short on time I can drink it on-the-go. This Tropical Kale Smoothie is a really refreshing way to start your morning, perfect for these warm summer days. The sweetness of the pineapple means that you would never know this smoothie contains 1 cup of kale. Pineapple and other exotic fruits are regularly on offer at this time of year, they are a great addition to any smoothie without increasing the grocery bill! Please stop by Goodness Me if you have the time, I hope you enjoy this one as much as I do! 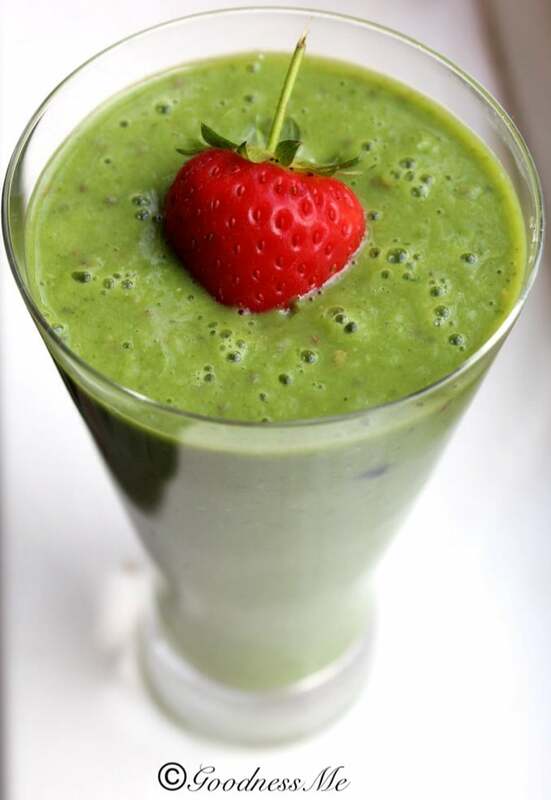 This Tropical Kale Smoothie is a really refreshing way to start your morning, perfect for these warm summer days. The sweetness of the pineapple means that you would never know this smoothie contains 1 cup of kale. Chop the pineapple and banana into inch size cubes, place them in the blender with the kale. Add the almond milk, water, chia seeds and flax seeds. (Note: if you prefer smoothies of a runnier consistency add another 1/4 cup of water). Blend until all ingredients are well mixed, pour into a glass, garnish with optional fruit and enjoy!